Saturday lunchtime and we’ve just had lunch at Bordeaux Quay. 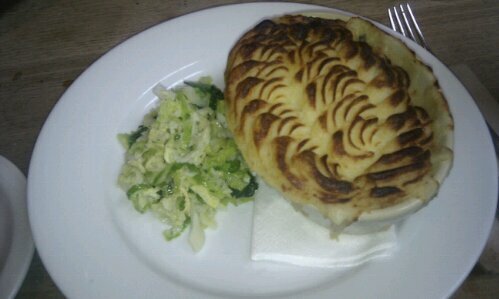 I had the fish pie and was warned that it would take 20 minutes to arrive, it took just under that amount of time. The fish content was a selection of the daily catch including cod, salmon and grey mullet in a creamy sauce and topped with soft, but textured, mash potato. The small but rich little dish lasted quite a while and was accompanied by a freshly squeezed orange juice. 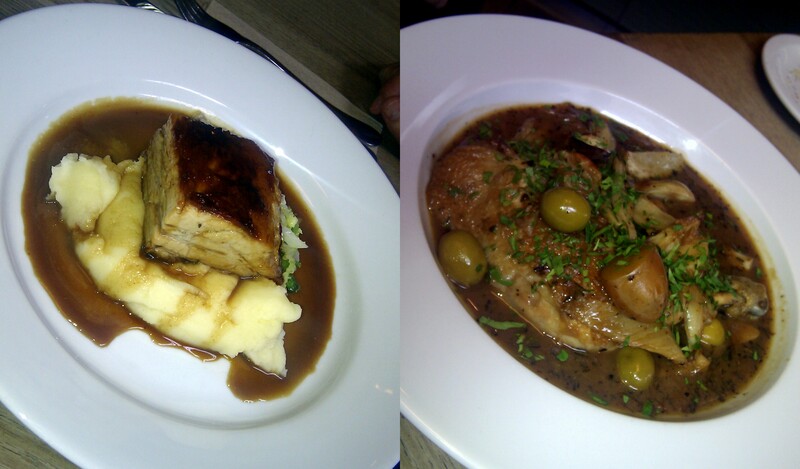 My friends ordered the loin of pork on mash and the chicken orviato, respectively. The pork loin was finished first and both dishes were highly praised, especially the sauces. Bordeaux Quay was all out of stouts so the guys drank Bath Ale Gem. The delicious desserts were left for next time. The chocolate pot with honeycomb and shortbread, the lemon meringue trifle and the bread & butter pudding with creme anglais, were left behind as we headed for coffee up and past Park St.
Browns was quiet and stuffy so we headed to Manos for a more Bohemian experience. A range of biscuits, cakes and brownies lined the counter top at Manos and the selection of drinks is made from a range of hot beverages, beers, spirits and cocktails. My coffee was limited to just black because there was no soy milk. I would have liked to try the gingerbread or vanilla latte, the caramel machiato, or the mint hot choc but didn’t fancy the milk. The drink choices were a Gem beer, a Corona with lime, and a black coffee. The latter was my choice and I had a second one as well. The music was funky and jazzy. 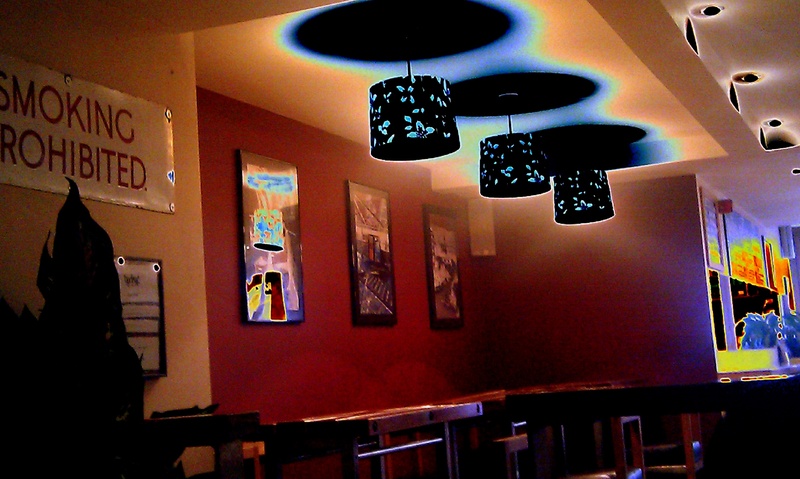 The walls were lined with pictures by Kochy. Glimmers of outdoor scenes helped lighten up the deep-set room and the grey atmosphere outside. Bright distractions of mopeds, a cabriolet VW bug and a cat on a couch helped place the mood in a slower time period where it was perfectly reasonable to spend three hours drinking coffee and having a chat. This visit was the first time I’d been in Manos and it was a relaxed and friendly experience. 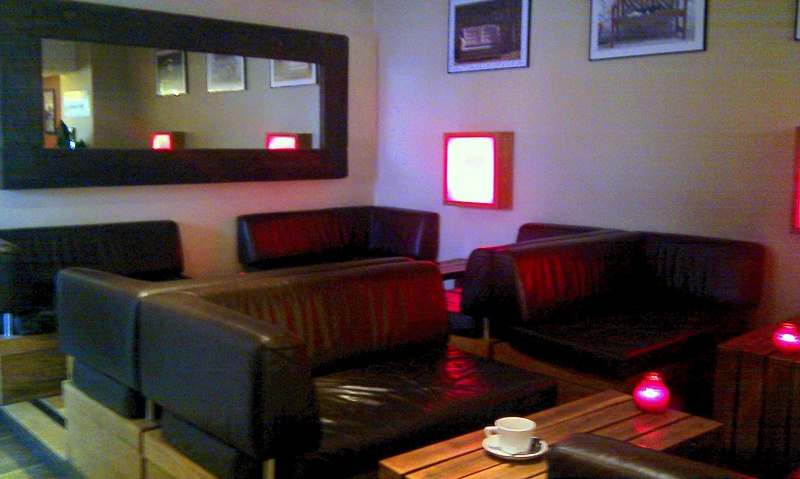 We sat at one of the couches towards the back and looked out to the room and the street outside. The few visitors, during the time we were there, seemed to know the guys behind the bar. The rest, including us, sat about quietly with one or two outside in the small courtyard towards the back. Even though the sky was grey and it was raining outside, the art, the coffee, the atmosphere and the company inside, provided a mellow little break away from reality. Most mellow and a great place to unwind. 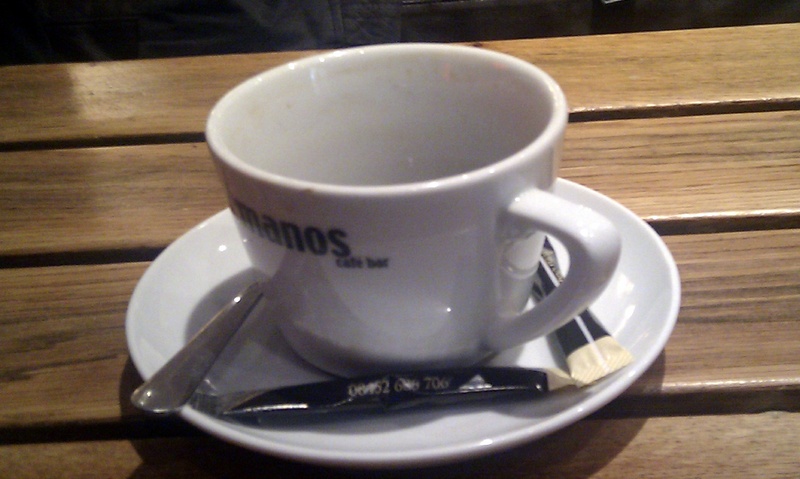 This entry was posted in Bristol, Coffee and tagged art, bohemian, Bristol, Coffee, drinks, Kochy, Manos, pictures, Queens Rd. Bookmark the permalink.